Be easy to program, so the Arduino IDE was a must. Be able to drive a TFT. Have enough storage capacity to store enough code & fonts for the TFT. Be relatively low cost, since it would have no influence on the dac’s SQ. Be easy to build / integrate into a new design, even by a novice. After some consideration, I decided to use an STM32F103 ready-made module. It would plug in to a “mainboard” of my design, along with the chosen TFT. It would be fast enough, have enough flash & ram, be easy to integrate and develop for and it would cost next to nothing. It can be found on Ebay by searching for “3.5 tft uno 320 x 480”. Expect to pay 6-8€ inc. shipping. After some searching I found a suitable library that (after some slight tinkering) would allow my tiny STM32 to drive it properly. (Note: do not download the library from this link. I will provide a customized version of the library together with my code). I found a ready-made library for configuring the Si570 and modified it to run on my STM32, using one of its hardware I2C ports. I will also include this library in my code. To complete the recipe I also found working rotary encoder and IR receiver libraries. Support for either Dual Mono or single chip setups. Support for the Amanero Combo384 USB to I2S module (must be set up as slave with MCLK/2 and F0,1,2,3 enabled). Control with one rotary encoder with push-to-select functionality. Display incoming signal sampling rate and type, determined by “reading” the relevant I/O pins of the USB to I2S board. Display and control of the AK4490’s digital filter. Selection of the proper MCLK frequency according to incoming SR and type and programming of the Si570 accordingly. Control of “DSD Direct” function of the AK4490s. Control of the DSD Filter’s Frequency (50KHz or 150KHz). Control of the Sound Mode of the AK4490. Choice of either inverted or normal analog output for the AK4490s. Choice of two sets of MCLK frequencies, either 22/24MHz or 45/49MHz. Remote power on/off functionality (or always on – configurable in the code). In the download I am including the modified versions of the libraries (as mentioned above) as well as the necessary font files. Be sure to extract the contents of “Libraries (place in Libraries folder)” to your Arduino IDE’s “libraries” folder. 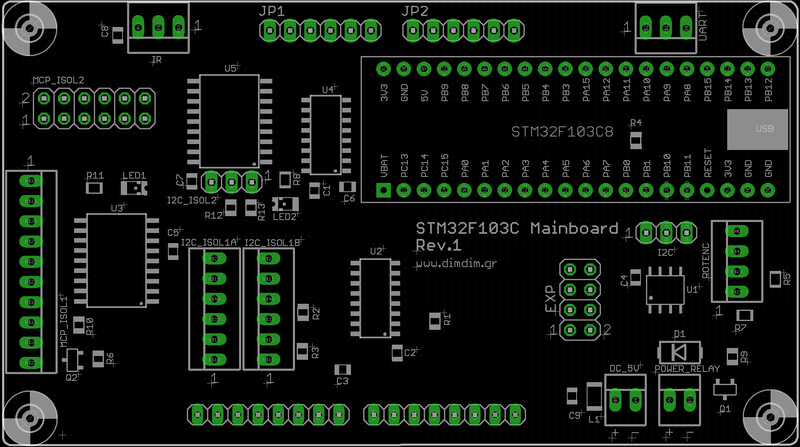 Minor changes to make compatible with current stm32duino core (changed HardWire.h to Wire.h and other minor stuff). First public release as part of completed dual mono DAC project. Enabled DAC synchronization feature (experimental..). Added support of rotary encoder and IR remote control. Added support of rotary encoder for volume control. Added support for dual mono mode. Added very basic TFT support. Code cleanup for first public release. Added full control of sound parameters through serial port. Automatic switching between PCM and DSD by monitoring DSDPIN. Accommodate an 24LC256 EEPROM chip, used to store the DAC’s configurable settings. Accommodate two sets of I2C signal isolators and I/O expanders. Include headers for the encoder, IR receiver, power relay, non-isolated and isolated I2C communication, unused uC pins, etc. You have to supply the board with 5VDC at ~300mA through header DC_5V. That’s it for Part 2. Stay tuned for Part 3: The output stage. 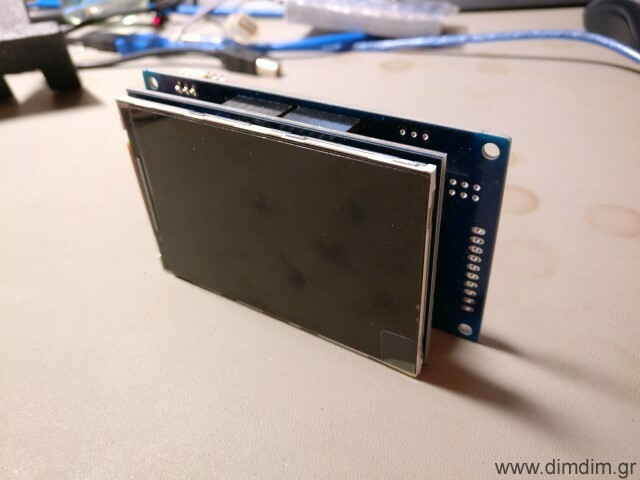 This entry was posted in DIY Audio and tagged AK4490, AKM, Arduino, I2C, IR, Si570, STM32Duino, TFT by Dimdim. Bookmark the permalink. Great! Could you upload aKduino v1.41? I need only dual mono mode for AK4490. v1.41 is pretty old.. There’s a good chance it’s buggy or not compatible with the current stm32duino core. I could email it to you (use the contact me link) but if I were you I’d just adapt the current version to my needs. Cutting out stuff is easy..
// Remove comment slashes (“//”) from your USB interface. Keep all other interfaces commented out. Library for the encoders RotaryEncoder.h is absent 🙁 . It’s not supposed to be included in the ZIP file because it’s not modified by me. I only include the libraries that I’ve needed to “adapt” to this project’s needs. For libraries that can be used “as-is” I prefer to just link them. Excellent project, thank you for sharing it! I am working now to draw my own version of 2 layers PCBs, with Xmos XU208 (for I2S of course, but also for I2C commands), and your project is a great source of inspiration. How did you managed the click noise between DSD tracks, only software mute or will you use relays? 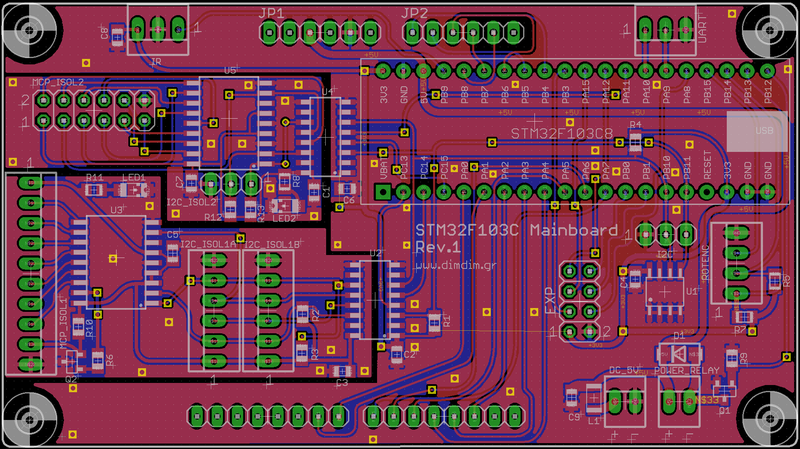 I too am finishing up an XMOS design with the XUF208 as well as an AK4118 for s/pdif inputs, no I2C though. I have the uC for that. The AKM dac chips have well documented problems with pops when changing between pcm and dsd.. they (akm) recommend using a relay to mute the output before making changes in the signal formats. But I don’t really remember having problems switching between different DSD tracks. I’ll check to see if it’s something I missed. The dac is still in development mode, so I’m not really listening to it most of the time. 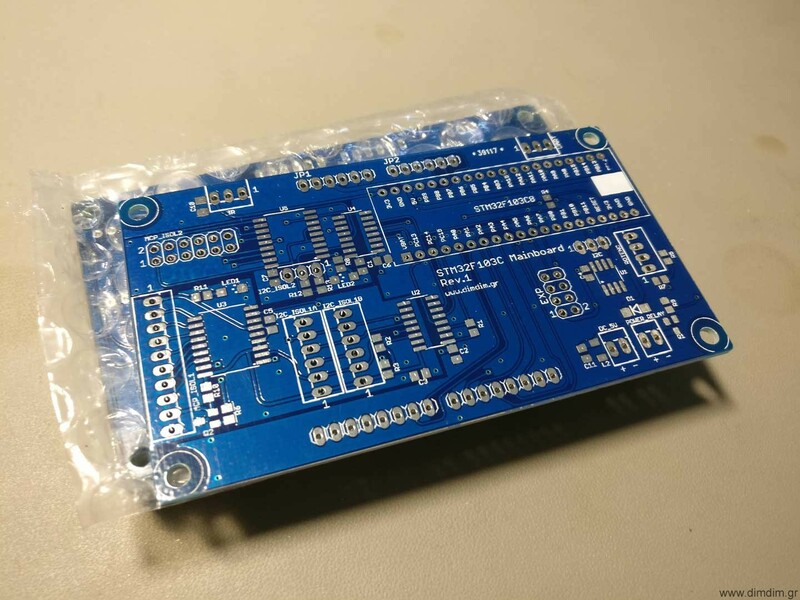 I have made a few XU208 and XUF208 boards using Amanero PCB size and pinout. The main reason was that Amanero requires different firmware for Windows and Linux (Daphile) and I want to avoid this situation. I have been tested them with a Chinese DAC based on AK4490, but the relay is not fast enough and sometimes I can hear a pop/click for a fraction of time before the relay acts. I finished a USB DAC project based on XMOS XHRA and dual AD1955 (controlled by a PIC uC) with I2S and SPI isolators, but the sound is better without isolators. Obviously it needs reclock and XMOS working as slave. The PCB I am working now is intended to be configurable, so if I will not succeed to make XMOS working as real slave, I will replace it with Amanero module, I will add STM32Duino board and I will move a few jumpers. Interesting that the relay turns out not being fast enough.. I have been worried that I would also have such a problem but I have not got there yet. Perhaps some solid state solution might be a better choice. I’ll look into it and keep you posted. Regarding the XMOS in slave mode, do you mean “real” slave mode, as in the dac generating the BCLK & LRCK signals and feeding them to the XMOS (along with MCLK) so that it only generates the DATA line, or just slaving the XMOS to the dac’s MCLK? Just slaving the XMOS to the DAC’s MCLK. When I said “real” I was thinking about my last finished project. The clocks are located near the AD1955s, on the clean side, I2S isolator is 3in-1out version, so I force the XMOS to be a slave without programming the XMOS accordingly. As you know, XHRA is some kind of XU208, but factory limited to the “official” firmware. It was obviously from the beginning it will not sound well, but it was worth to try. hey, thanks, great work 🙂 Took a look at the code and it seems to be really well understandable. I like that a lot! By the way, what’s the code’s license? Public domain, GPL,…? I’m *considering* packing a lot of your AK4490/AK4118 stuff into separate libs to make it easier to reuse (and publish it on github under the same license, preferably GPL, and of course referencing you as the original author in each file). btw, this post is missing the ak4490 tag, that’s probably why I missed it and asked for it on part 1. Crap, I missed this comment! Sorry..
You’re right about the tag, I’ve fixed it..
Would this also work on the ak4497 chip ? I haven’t gone that deep into studying the 4497’s datasheet but I doubt it.. Many of the parts of the code will probably work, but the 4497 is not register-to-register compatible with the 4490. The more i read your blog the more I am intrigued to build your dual mono dac. I am bit novice on diy dacs but have soldering skills. How the dual dac compares (soundwise) to the single ak4997 diyinhk board? I haven’t listened to any 4497 based DACs. Thx for Your work. 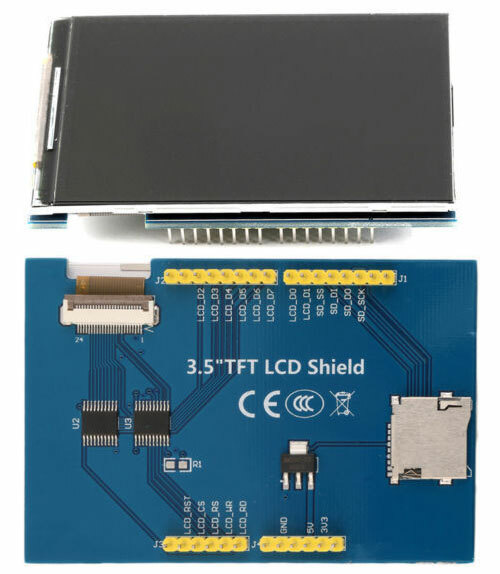 I;ve bought tft board and i;m trying to get it works. I use stm32 and Yours librarry Adafruit_ILI9481_8bit_STM. I still got white screen. I;ve checked all wires, i;ve made a small test application to check if all pins of STM react for command on/off. Any suggestion? Maybe it it’s bad TFT screen (out of order/dead). It might be a bad LCD, but it also might be an LCD with a different controller. Does it look exactly like the one I have? I have come across a couple of seemingly identical LCDs that worked but displayed an inverted image. It is a very wonderful site. By the way I want to control multi channel DAC (4 x ak 4490) without your si 570 with your controller. Is it possible? It seems difficult for me to rewrite code. The AK4490 has a configurable I2C address that can be one of 4 unique values, so if you set up each one of your 4490s with its own unique address you can control all of them with a single I2C bus from a single controller. If you look in my code I mention the different possible 4490 addresses and how to configure the code for them, assuming I’m controlling 2 x 4490s each of them in mono operation. It wouldn’t be difficult to change the code to support 4 chips in stereo operation, all of the building blocks are there. But you will need to learn how the 4490 chips work by reading the datasheet and then make some changes to the code. I cannot do that for you, I simply don’t have the time. But I can help if you get stuck somewhere. Yes, I saw the code. Is it possible to perform 8ch play and volume control just by setting CAD 0 & CAD 1 of the board? 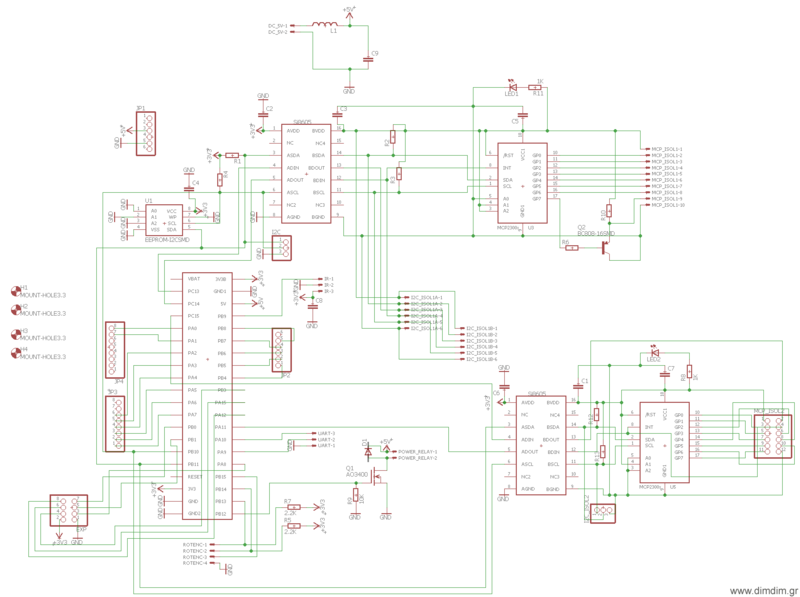 The CAD pins only configure the I2C address of each chip. You then have to “talk” to each chip over I2C to control its volume and set it for stereo operation (not much to do for the latter – by default the 4490 will work in stereo mode). I will try erasing the code of SI 570. Before you start changing things in my code you will need to read the datasheet so as to decide what exactly you would like to do, like running the 4490 in auto or manual mode. These decisions influence parts of my code. I want to set SR automatic setting and fix it to 24 bit, but even if I change the code register 0H to 10000111 it does not work. I am in trouble because I can not compile by merely deleting the Si 570 code.